Dream of owning your own private island? 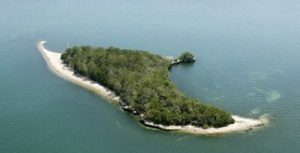 You can buy Middle Sister Island, just over 8 acres of pristine beach and woodlands in the Canadian waters of Lake Erie, for $888,888 Canadian. That’s less than $685,000 American. The island, west of Pelee Island and the most wild and undisturbed of the Pelee archipelago, has been for sale for more than two years and is listed by Team Goran, a Re/Max Realtor based in Windsor, Ontario. Middle Sister is about 17 miles from Ohio’s South Bass Island. It was used by Gen. William Henry Harrison as a staging ground for invading Canada during the War of 1812. See the full list of Lake Erie islands.